27No one knows the Son except the Father, and no one knows the Father except the Son and anyone to whom the Son chooses to reveal him. It sounds more like the Gospel of John than one of the synoptics. “Do you not know me Phillip? He who has seen me has seen the father.” “The Father and I are one.” But here it is, in the middle of Matthew’s Gospel. There is a certain proverbial character to this statement. In that time and place the eldest son was the father’s representative. To do business with one was to do business with the other. To have the word of one was to have the word of the other. People were defined by their families. To know the Father was to know the son. People were not seen as individuals in that day but part of extended families. And families kept family business private. Public reputation mattered. Family secrets were never shared. Such information could be used against them. What might be revealed would only be revealed to family. So to say “No one knows the Son except the Father, and no one knows the Father except the Son” is something of a tautology, a truth everyone would recognize. What’s different is that Jesus is not speaking about Joseph. The thunderclap in this simple little aphorism is that Jesus is speaking about God and himself. Jesus is the one with insider knowledge about God. Everyone talks as if they know who God is and what God wants. It is a hubris of our time. Protesters at rallies for marriage or for life carry signs declaring God’s thoughts with absolute certainty. Clergy from liberal traditions wear their collars to union rallies to declare God’s support for some piece of legislation. We do not say “Thus and so seems best to us in light of what we read in scripture so far as we understand it, though others read it differently.” We say God is on this or that side. Even those who state categorically that there is no God are declaring what they cannot know. 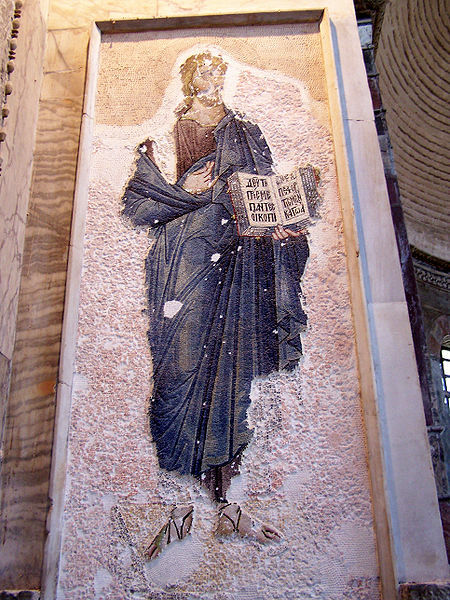 The God who hides himself is revealed by the Son in the healing of the sick, in the feeding of the hungry, in the releasing of debts, in the raising of the dead, in acts of mercy and justice, in words and actions that call us to regard all people as members of our own clan – even the soldiers asserting Roman rule in the homeland of others. The God who hides himself is revealed in the Son who welcomes outcasts and forgives sinners and washes his followers feet. The God who hides himself is revealed in the Son who lays down his life and meets Mary at the tomb and sends his followers to all nations. Jesus is the one with insider knowledge about God. He has chosen to reveal this much to us and not too much more. We should not be afraid to say what we know of the Son – just careful with what we think we know of God. It is easy to get this wrong, but so important to get it right. There are so many things in these texts for Sunday that are pricelessly sweet. It is important to remember that the Christian faith is not dry toast but toast slathered with butter and a generous layer of thimbleberry jam. I had my first thimbleberry hiking with my daughter, Anna, on Isle Royale in Lake Superior. Yes, everything tastes better when hiking – but the thimbleberries we discovered on the trail tasted like a champagne. They had an effervescence that roused your mouth with joy. There is a monastery in the Upper Peninsula of Michigan that makes a wild thimbleberry jam that a friend brought for me as a gift. It reminds me of Anna, that summer, and all the sweetness and joy of life. It is important to remember that the Christian faith is not dry toast but toast slathered with butter and a generous layer of thimbleberry jam. The ship of the church in our time and country seems to be listing heavily to port or to starboard. Either the message of the church is all grace and no summons to follow – or all summons and no word of grace. We can’t quite seem to get this balance right that we are being called to take up our cross and follow – and that this is an easy yoke that brings rest for our souls. It is toast and jam. Not just jam. Not just toast. But toast with jam – and toast with jam can never be just toast or all jam. It is always a discipleship energized by joy. “Take my yoke upon you.” There is a yoke. There is a service. There is a lord before whom we bow. There are commands to be obeyed. Tithing is not a suggestion. Hospitality, forgiveness, generosity, holding your tongue, loving your neighbor, are not strategies for a more rewarding life; this is the path set before us. But it is a path lighted by the brilliance of Easter morning. It is followed amidst the song of redemption. Christian faith is not dry toast but toast slathered with butter and a generous layer of thimbleberry jam. 29Take my yoke upon you, and learn from me; for I am gentle and humble in heart, and you will find rest for your souls. 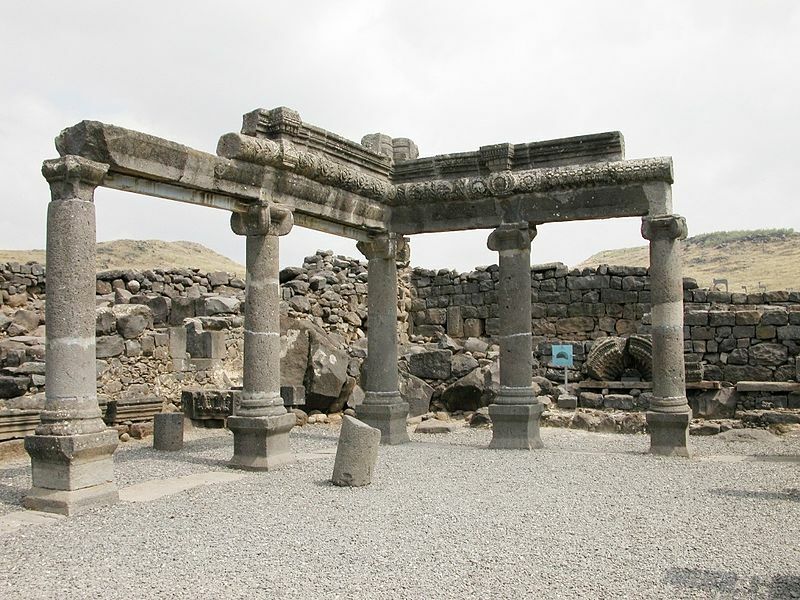 Ancient Synagogue in Korazim Israel. Then he began to reproach the cities in which most of his deeds of power had been done, because they did not repent. 21 “Woe to you, Chorazin! Woe to you, Bethsaida! For if the deeds of power done in you had been done in Tyre and Sidon, they would have repented long ago in sackcloth and ashes. The Phoenician city/kingdoms of Tyre and Sidon were not the great military powers that threatened ancient Israel – they were the great cultural and economic powers, wealthy, prestigious, traversing the Mediterranean with the wealth of the nations. It is Tyre that teaches Jerusalem how to build a proper palace and temple. It is Sidon that forms an alliance with Israel sealed by the marriage of Ahab to the Sidonian princess Jezebel. It is Jezebel who sets out to replace Israel’s archaic faith with a modern, progressive understanding of the gods – the worship of Ba’al, the god of the storm, the source of rain, the bringer of fertility and prosperity and his consort, Ashtoreth (Astarte). It is Jezebel who teaches Ahab about “modern” kingship and the use of power, arranging Naboth’s murder in order to seize his vineyard for a garden. It is Jezebel who vows to murder Elijah after the great showdown on Mount Carmel that results in the people rising up to slaughter the priests of Ba’al. Had these cities, symbols of idolatry, seen what the towns of Galilee had seen and heard in Jesus, they would surely have repented – changed their allegiance from gods of wealth and fertility to the LORD who rescues slaves, defends the poor and delivers the needy. They would have embraced the reign of God dawning in Jesus. It’s a little like saying Wall Street and Washington would become models of piety and compassion, servants of justice and the poor. Woe to us, how shameful, that we have seen the majesty and mystery of God in this Jesus and do not acknowledge that he is of God, that he speaks the eternal truths, shows the path of our true humanity, and brings to us God’s gifts of healing and life. There is nothing here or elsewhere in the Scriptures that celebrates ignorance when it critiques “the wise and intelligent”; these words challenge the elites of society whose attachment is to the world they have created rather than to the world God is creating. They may be wise about war and politics and the manipulation of markets; but they are ‘fools’ when it comes to that which is eternal and enduring. Their allegiance is to Rome rather than the New Jerusalem, to their power and privilege rather than the justice and compassion of God. But some have seen: the poor, the indebted, the enslaved, the wounded, the outcast – the powerless and inconsequential ‘infants’ of the day – they have seen and welcomed the dawning kingdom. And for these who see Jesus gives thanks to God. In the mystery of God’s working, these are the ones who change the world. My father’s mother was a feisty woman, small, thin, tough. She had a wrist full of bangles and a cigarette in her mouth as she whipped cream by hand. She made the most exquisite Danish sweets – and frikadeller to die for. Everyone gathered in the kitchen to watch her do the Danish potatoes, in the vain hope we could replicate her feat of beautiful small round potatoes in a perfect thin brown glaze. She could drop you with a Charlie horse – her knuckle into your thigh – and could drop over from her heart condition anytime she was losing an argument. She was raised in an upper middleclass home in Denmark, married an instructor in the Danish agricultural college who was doing sugar beet research in the Ukraine when the Russian revolution broke out. He was invited to America by a sugar beet company (as a researcher, so he had been led to believe, but when he arrived he discovered they brought him here to farm). So this woman who had never done domestic work became a farm wife who survived the dustbowl and depression in America. I thought for a while that the secret was to accept the sherry but not drink it but then realized that would have been the worst of all – wasting perfectly good sherry. 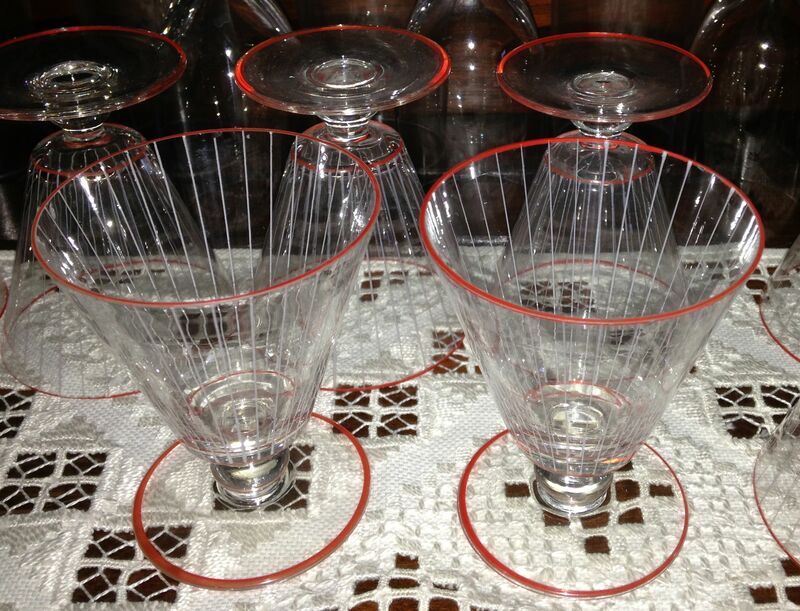 When Farmor died, I asked to inherit her sherry glasses. Congregations are like this. Maybe it’s a quality of religious people. Maybe it’s a characteristic of our humanity. We say, “There’s no pleasing some people,” but it’s more than some people. We all have a remarkable ability to set ourselves up as judge. Sometimes the consequences are tragic. The elites of Jerusalem dismissed John as too rigorous and Jesus as too liberal and received neither prophetic voice. They missed the time of their visitation. It is amazingly easy for us not to hear what we don’t want to hear. We dismiss the message for some fault we find in the messenger. And since there are always faults to be found, we need never listen. So we hear the preacher say that Jesus tells us to love our enemies or forgive those who sin against us – and though we don’t necessarily criticize Jesus, we criticize his spokesmen and women and keep on as we always have, nursing our grievances and perpetuating our hates. We gossip about the one who tells us that God commands us not to gossip. We ignore the message because of the messenger. But then we cannot gain the kingdom. The messengers are frail. This is part of the mystery of the incarnation. God comes to us in a human being (Jesus) and through human beings (one another). God comes to us through the human voice and human hands and through bread, wine and water that are taken from the soil and worked by human hands. The messengers are frail. But we do not imagine that Christ does not come to us in the bread because we don’t like the taste or texture of it. And Christ is still in the wine whether it is red, white or golden. And Christ still speaks through our sisters and brothers whether they are too serious or too playful. We are not listening to the messengers; we are listening to the voice of Jesus that comes to us through them. As messengers – we are all messengers – we should try to be worthy of the message. But the point is the message not the messenger. Unless we are not interested in the message at all, but only – like the Jerusalem elite – in retaining our power and privilege, our comfort and convenience. In which case, neither John nor Jesus matters. But our loss is great. Rest is not a small word in Israel. On the seventh day God rested: the work of creation moves towards rest. The slaves God delivered from Egypt were commanded to observe a day of rest, rest not just for themselves but for their servants and animals. Even the fields were to have a Sabbath rest. Rest is in the fabric of creation and it is our salvation. The Book of Hebrews speaks of the age to come as our Sabbath rest. The Sabbath is a unique covenantal sign of Israel, an ever-abiding command. The neglect of the Sabbath was one of the reasons for God’s judgment against Jerusalem, and honoring of the Sabbath one of the defining marks of the faithful eunuchs and foreigners God welcomes into his sanctuary. Jews were mocked by Roman society for giving slaves a day off. The Pharisees defended it forcefully – even against Jesus’ attempts to heal and free on the Sabbath. But Jesus rebuked them for failing to understand the Sabbath. Sabbath is not a ritual obligation; it is the day of salvation, the day of new creation. So in this simple and familiar promise, “Come to me, all you that are weary and are carrying heavy burdens, and I will give you rest,” Jesus is speaking a profound word. “I will give you rest.” I bring you God’s Sabbath. I give the rest God intended for us. I give deliverance. I bring the day of salvation. I lift the burden of humanity’s weary labor by the sweat of their brow. I restore humanity to those days when God walked through the garden in the cool of the evening. I make all things new. This is far more than a promise to weary field hands and servants. It is the invitation to enter the reign of God, into the realm of the spirit, into the world of joy and life and peace, to dwell in God’s grace and compassion, to become sons and daughters of the Most High, to live the kingdom. Jesus does not do away with the Sabbath, he fulfills it. He brings our true rest, our healing, our wholeness, the fullness of our humanity. And he invites us to live it. 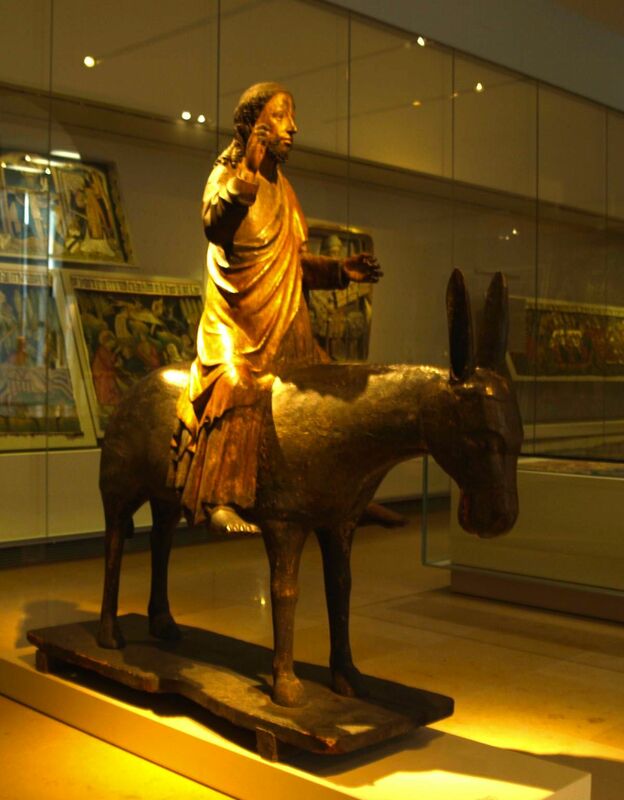 A wooden sculpture of Jesus Christ on a donkey (c. 1378), Germanisches Nationalmuseum in Nuremberg, Germany. “Lo, your king comes to you… humble and riding on a donkey.” Zechariah promises a king who will ride to Jerusalem upon a donkey. It is the ancient rite of accession in Jerusalem – the king coming in humility and as a symbol of peace. But the prophet is not promising window dressing and political posturing. He proclaims God’s living promise for a people who have known too much war. The psalmist, too, speaks of kingship this Sunday, celebrating the God of mercy and steadfast love whose dominion endures forever, and who lifts up the downtrodden. The elite members of Judean society criticized John for being too severe – and Jesus for being a glutton. They dismissed John’s prophetic voice because he fasted excessively – and Jesus because he didn’t fast enough: comfortable excuses for ignoring their message that the God of justice and mercy was coming to reign among them. But there are those who hear. Those who enter into this reign of God. Those who take up this yoke that is not a brutal burden of tribute and taxation, but a glorious and gentle rule of grace and life. A sharing of bread. A forgiving of debts. A lifting up of the downtrodden. A healing of the sick and freeing of the bound. A dawning of the Spirit of God. that, following your Son, we may find true rest for our souls. “Lo, your king comes to you; triumphant and victorious is he, humble and riding on a donkey, on a colt, the foal of a donkey.” – A prophetic message from the book of Zechariah promises a king to come – not as conqueror upon a warhorse, but as prince of peace upon a donkey. It comes to us in the weary years after Babylon has fallen, but Judah is a poor backwater of the Persian empire. “Wretched man that I am! Who will rescue me from this body of death?Thanks be to God through Jesus Christ our Lord!” – Paul uses the image of possession (compelled to act against our own will) to expound his notion that the death of Christ has freed us from our bond service to Sin and made us servants of God.